Naugatuck began as a farming community in the early 1700s, but the hilly terrain and rocky glacial soil made farming difficult, and quite early led people to utilize the brooks for waterpower to run small shops. In the nineteenth century, the effects of the Industrial Revolution in Britain brought about the factory system, and for the first time machinery was used to mass-produce goods. More and more people worked in factories. Industrialists prospered in Naugatuck. Not only did they build substantial residences but often put up buildings such as schools, churches office blocks, libraries and other structures to improve the appearance of the town. Mr. John Howard Whittemore is remembered for influencing the architecture of such buildings as the Whittemore library, Salem School, Hillside School and the Congregational Church. All designed by the company of McKim Mead and White. John Howard Whittemore and Bronson Tuttle were industrialists who began the Naugatuck Malleable Iron Company in 1850 and made their profits once the railroad came to town and also as a result of the Civil War. Early on, water provided the power, but with the coming of the railroads in 1848 coal could be transported with ease and steam power became the dominant force in providing power to run machinery. By 1880 the New England Railroad also passed through the northern part of town and provided transport to Danbury, Newburgh, and other destinations. In the period between 1820 and 1850 Salem Bridge clocks were famous for their unique qualities. The clocks were named for the original settlement, Salem Bridge, that later became Naugatuck. First manufactured here on Water Street in the 1820's by the Clark brothers from Plymouth, the clock business was carried on later by the Ward, Spencer, and Hotchkiss families. Naugatuck was located on the Litchfield Turnpike connecting New Haven and Litchfield by stagecoach. A couple of favorite stops between New Haven and Litchfield were the Collins Hotel in Straitsville, and the Beecher Inn in Salem Bridge, across the street from the tollhouse, which stood on Church Street near the dam. In the Naugatuck Valley, this town was often called the Rubber town. Charles Goodyear's father had moved to Naugatuck from New Haven when Charles was about five years old. This was to have a major influence on the development of Naugatuck. Some years later, Charles became fascinated with crude rubber and realized it must have possible uses. The story of accidental vulcanization on a laboratory stove is well known. By 1843 Goodyear was able to undertake the manufacture of rubber shoes and out of this developed an industry that employed thousands of people here. Goodyear was highly inventive and obtained many patents, but was a poor businessman. By his death in 1860 he had lost control of the business, which was carried on by others. 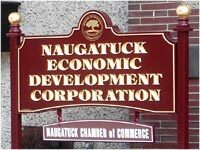 Today Naugatuck is one of only nine boroughs in the state of Connecticut. It became a borough in 1844. One of the differences between a borough and a city or town is the title of the elected officials. Naugatuck does not have councilors or aldermen: the town leaders are called burgesses and it is lead by an elected Mayor. Naugatuck is proud of native son Adrian Gilbert Greenberg, Hollywood designer who designed costumes for the Wizard of Oz.